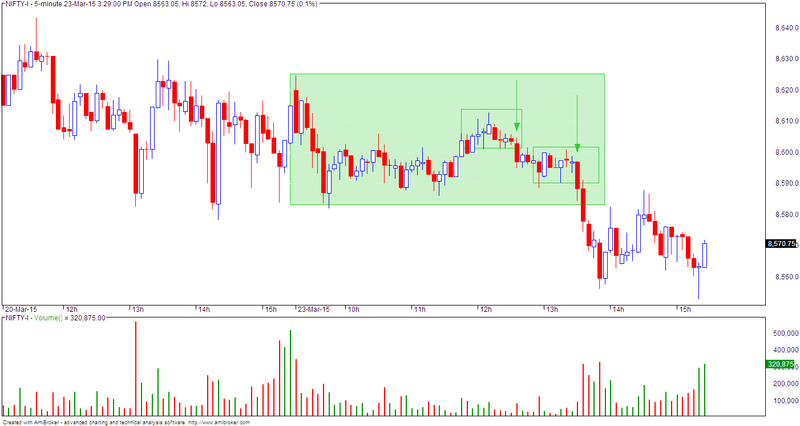 - short trade possible above 8585 F (4 candlesticks forming upper tails - shown in box). 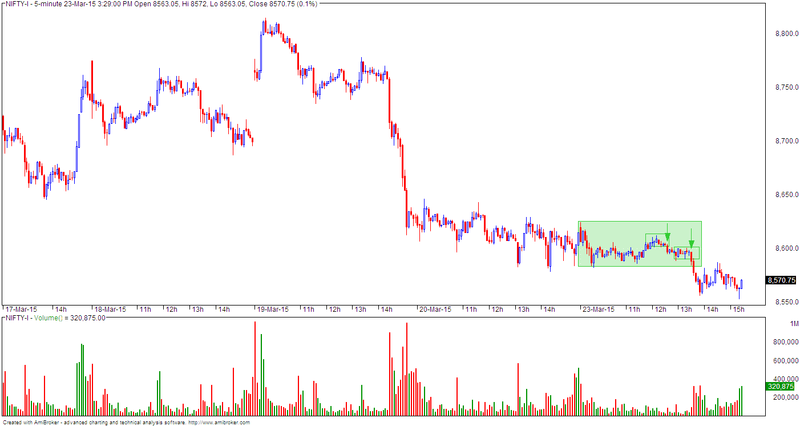 - breakout fails / short trade gets initiated. A picture is worth a thousand words...and this is true of any chart. This is the most basic chart. 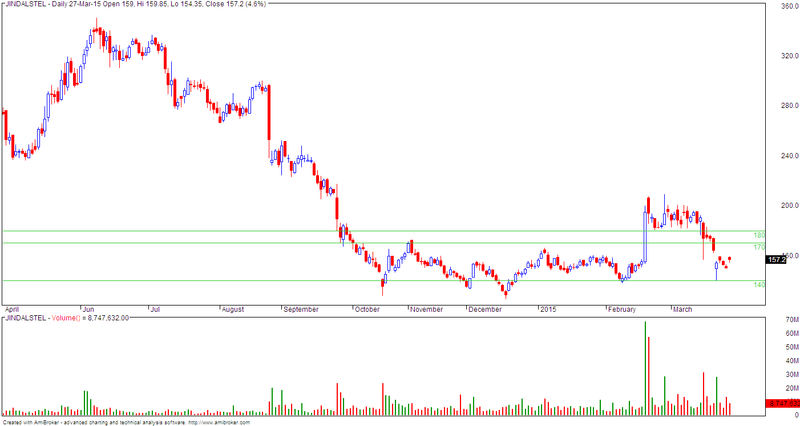 Take the following chart of ADANIPOWER. 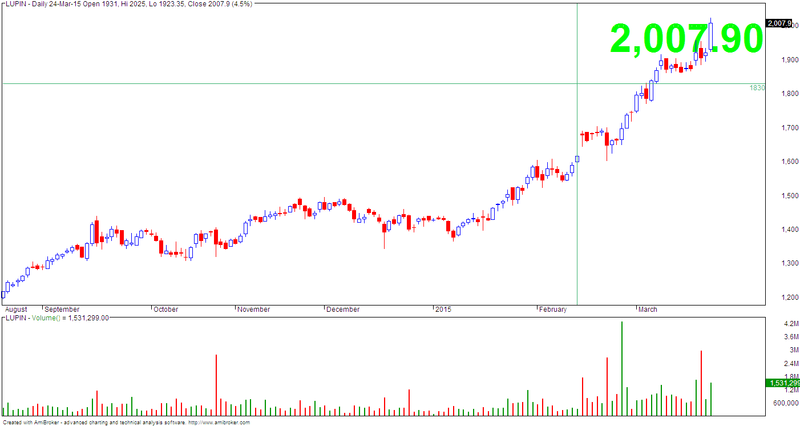 A simple look reveals that the stock has been in an uptrend and has minor corrections from time to time. Line charts are plotted using the "closing" price of the stock. 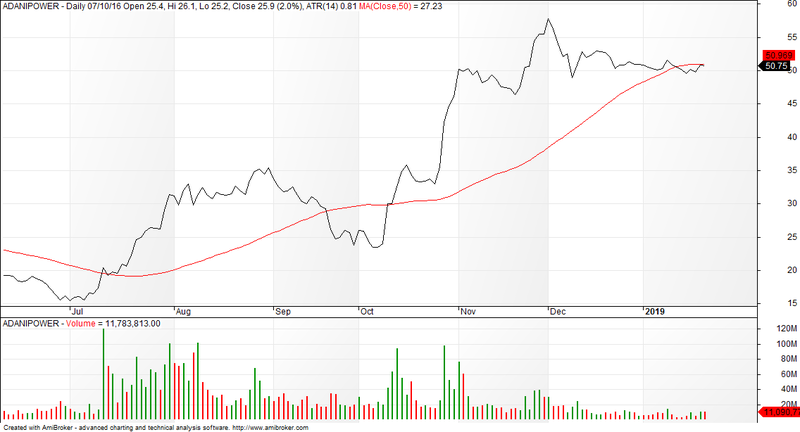 The red line represents the 50 day moving average (DMA). Candle sticks (a 300 year old Japanese technique) give more information like open, high, low and close. 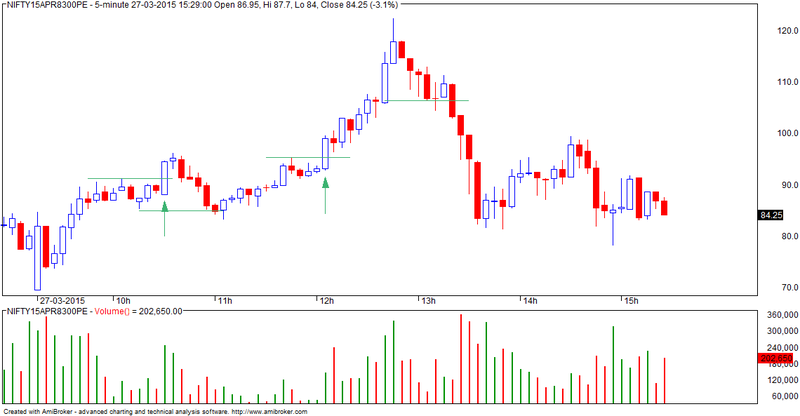 Red candles means stock closed lower relative to the previous close. 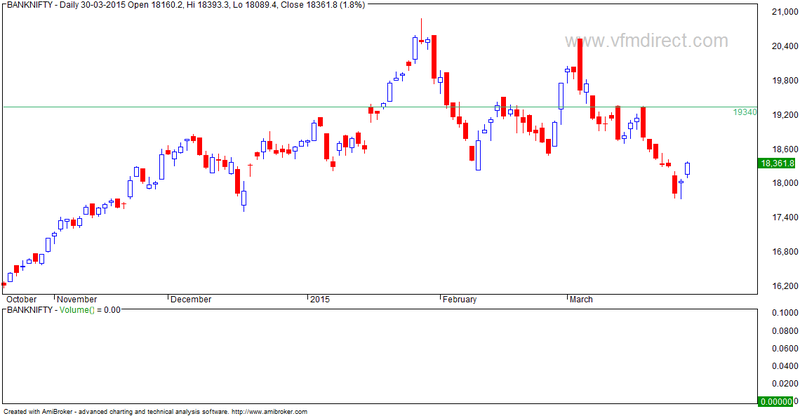 Green candles means stock closed higher relative to the previous close. 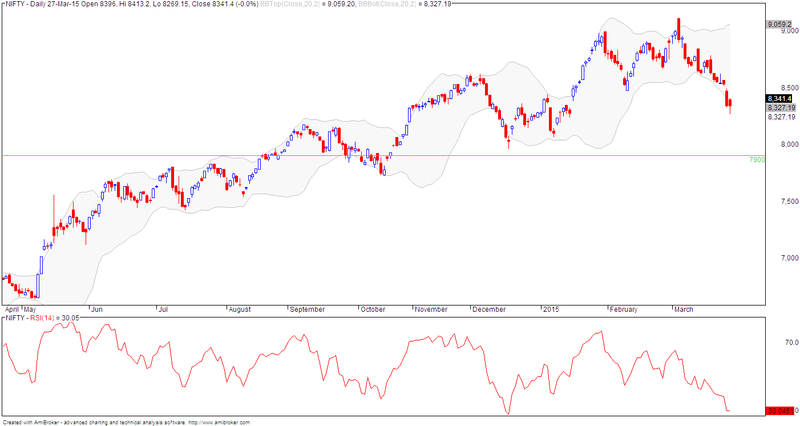 Here 14 day RSI is approx 30... on 5 day RSI, Nifty is already oversold (10). 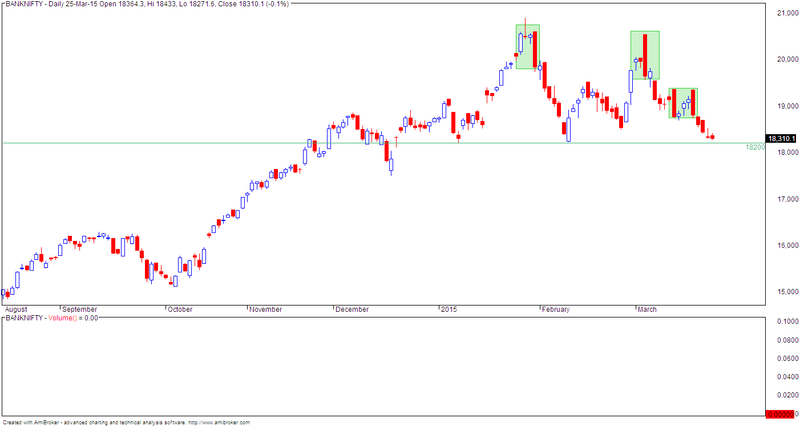 While nifty moved from 7400 in June 2013 to 9000 this year, this stock crashed from 340 levels to 160 levels in the same period... so much for underperformance. 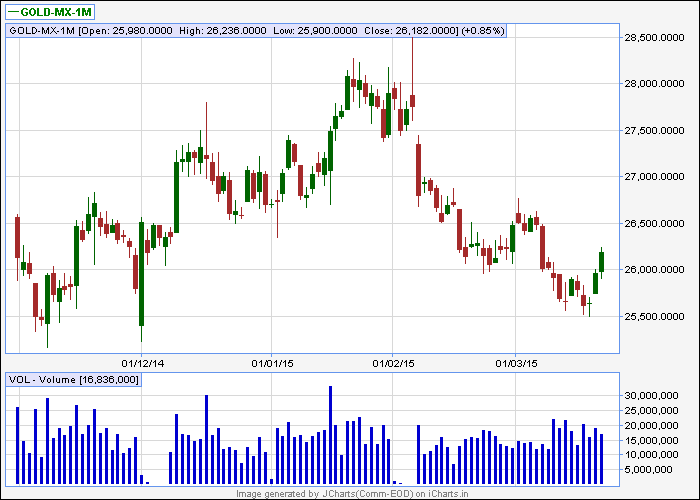 Now it seems to have bottomed out and I was long and got stopped out but the charts are still looking good. 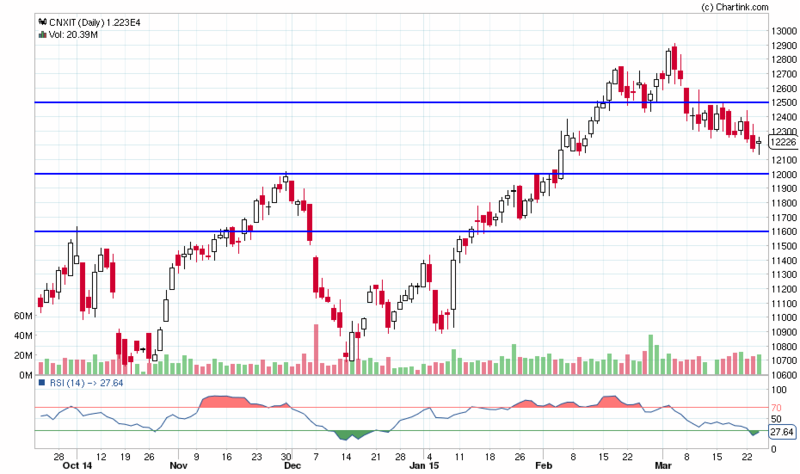 Support and resistance levels are plotted on charts. 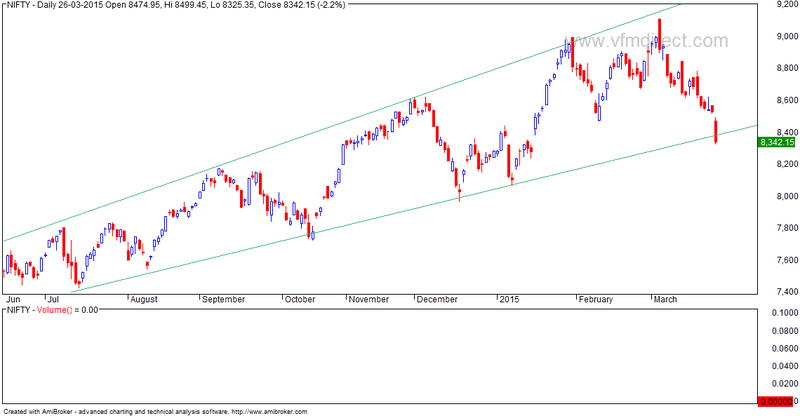 We have an expanding triangle on nifty weekly charts. 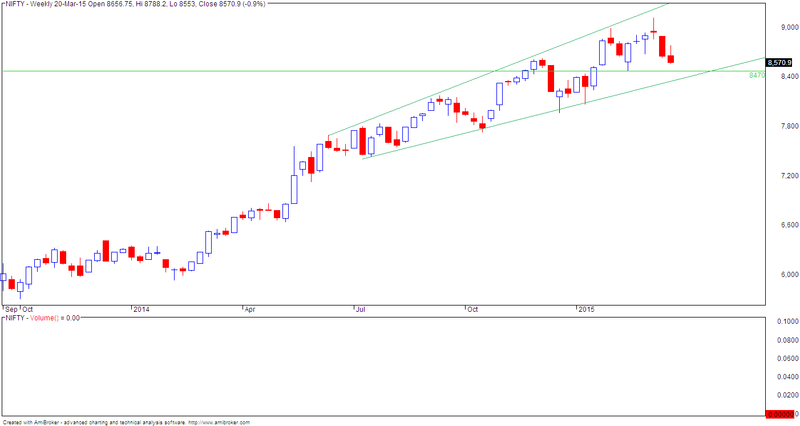 This is a bearish pattern and pattern implication calls for a correction to start of the triangle i.e. 7400. Time frame - less than 1 year. The bigger picture calls for the start of a multi year super bull run after this period. Disclaimer: information in this site is for entertainment only and not for any other purpose. 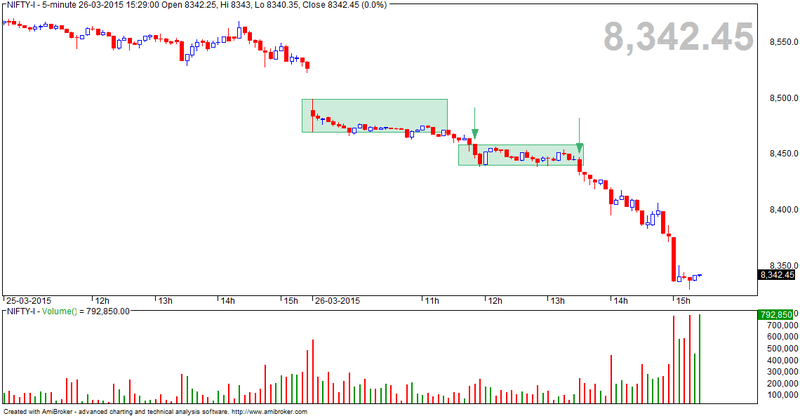 - second sell signal was on break below second box. - I did not trade today. Will short covering start now? 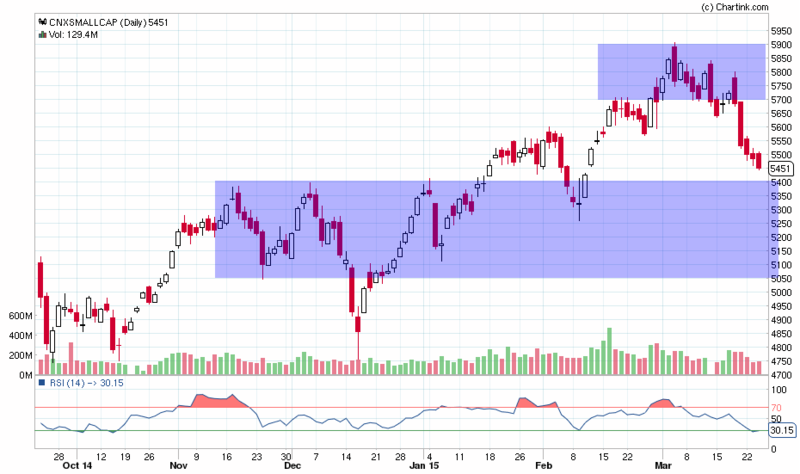 market internals do not look too good as of now. 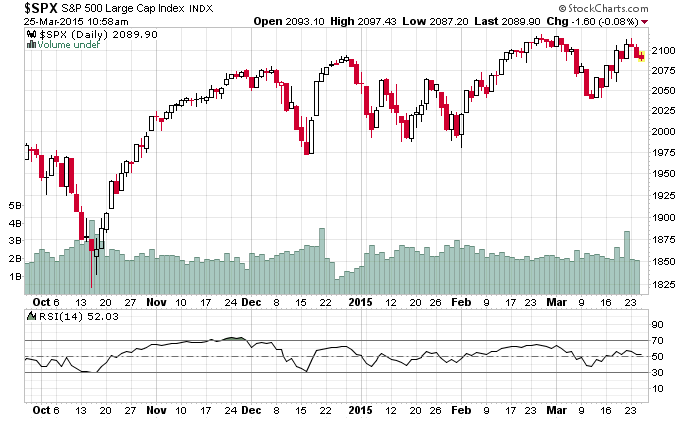 In the first week of Dec 2014, the S&P500 was around 2075. 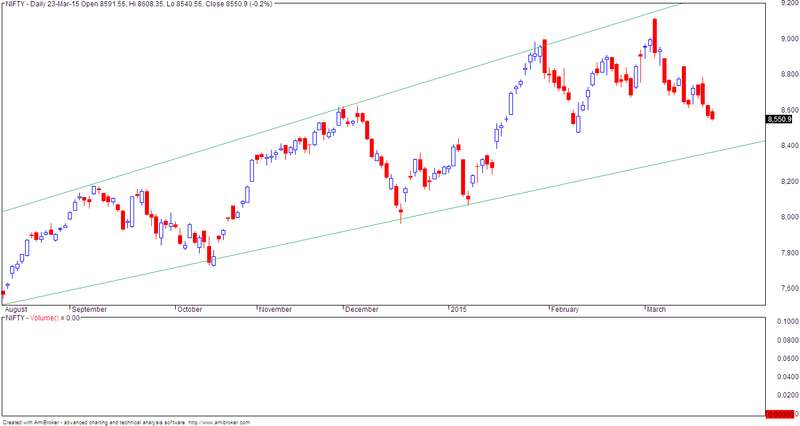 Today it is around 2090... so after 4 months, the index has achieved nothing and has done only timepass. - horizontal lines denote trailing SL for short trade. 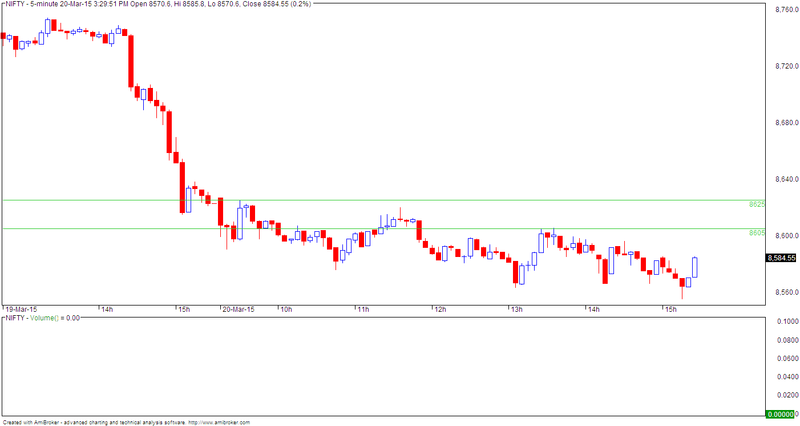 - holding above 8630 spot will be bullish tomorrow. 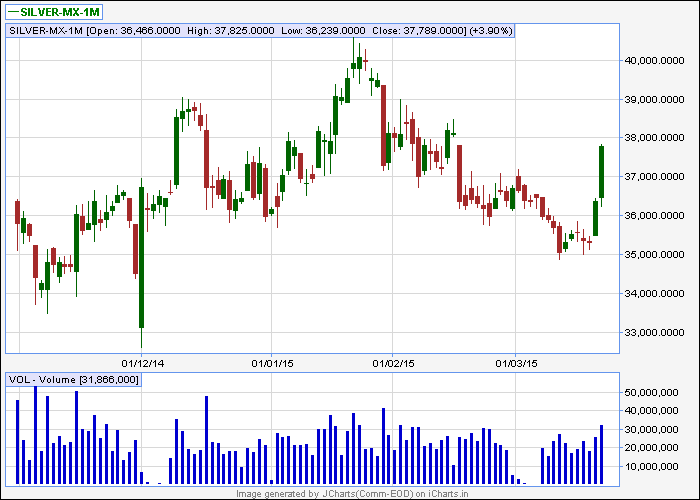 Many people have asked how to display the current price in large font as in the following chart. This is a one time post to clear certain impressions. 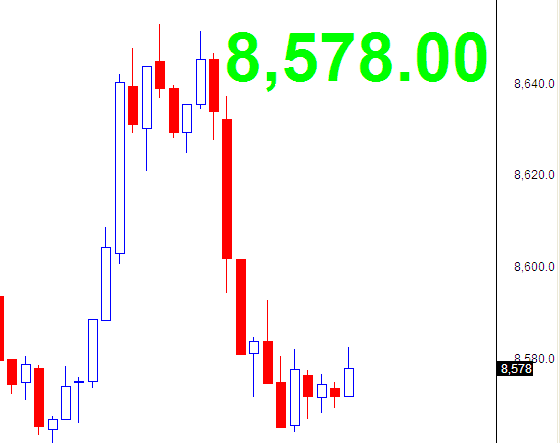 People sometimes get the feeling that it is easy to post trades after market hours and thus appear intelligent. What about real trades? 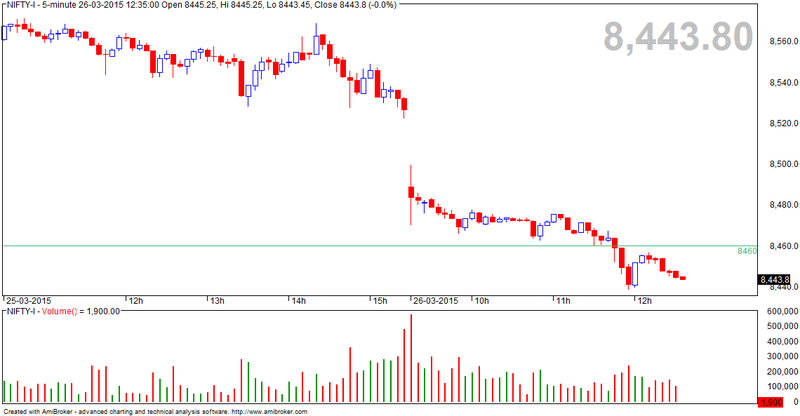 - total long 2000 options of 8700 call ... positional / still open. 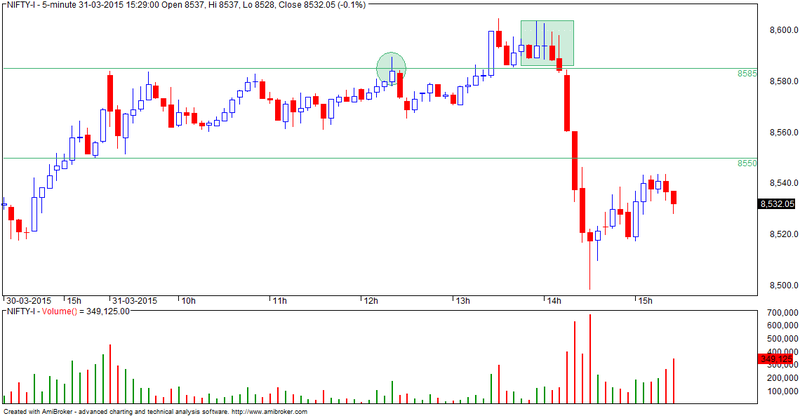 The last trade was badly managed.. had this been exited immediately, overall profits would have been 30K more. 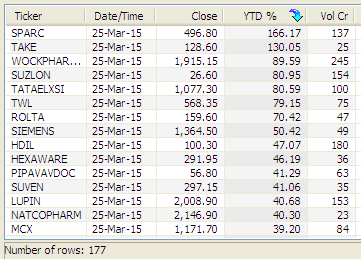 And this is the screen shot of the net positions. This does NOT indicate the time or the order of the trade. It shows only the total quantity. 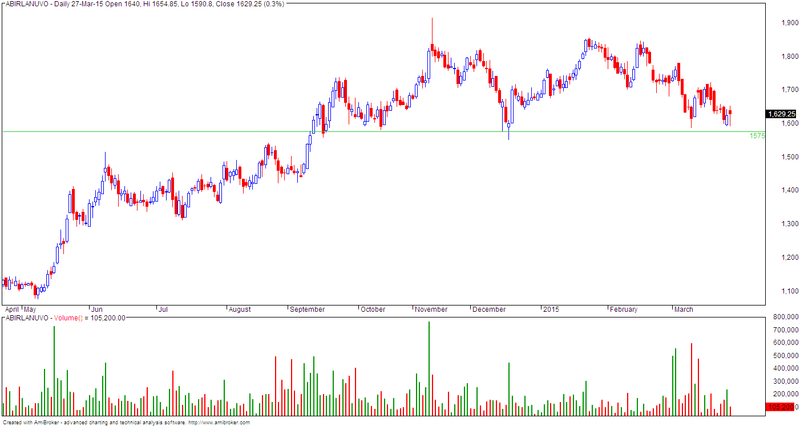 I normally trade 1000-2000 shares per order... this depends on option premium, volatility, where I am entering the trade etc. Also, I add more positions only if the previous candlestick is in profit. This automatically caps the risk. Trading logic is explained in this post. 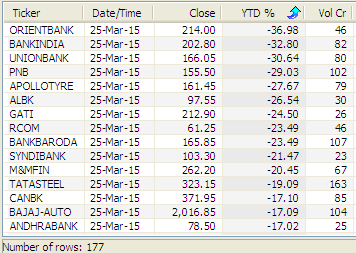 NOTE: I do not offer any intraday/ F&O services. - first 2 bars were strongly bullish in light of gap down opening and fast up move. 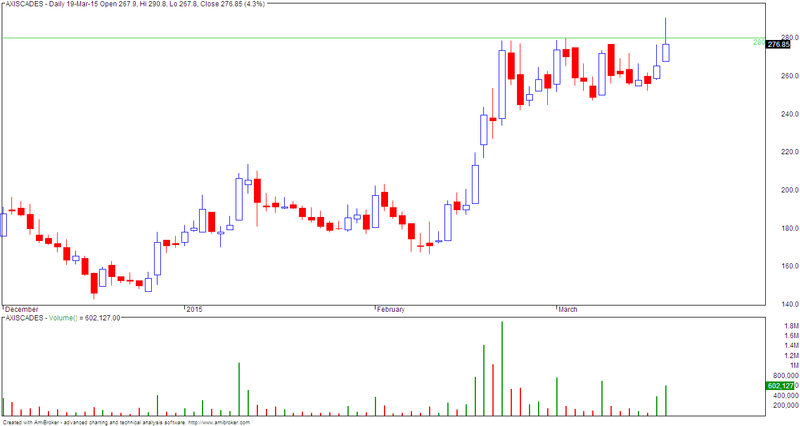 - Exited 70-80% positions immediately as there was no follow thru buying. 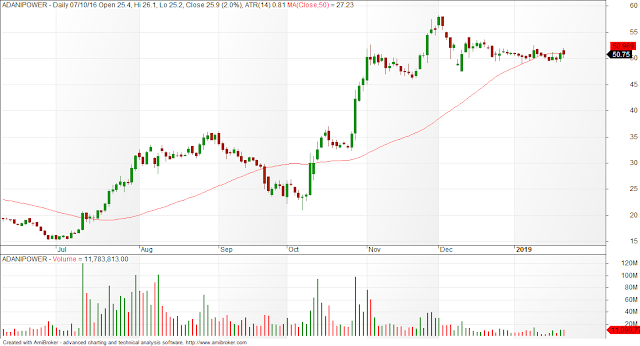 - In hindsight, I should have exited ALL long positions and bought again near market close. 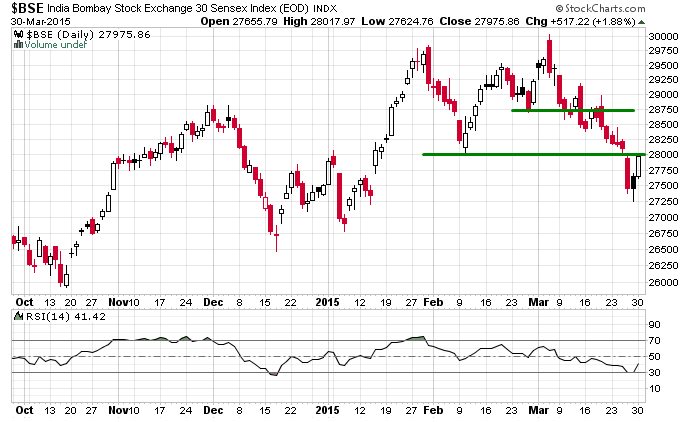 - markets close to bottoming out. 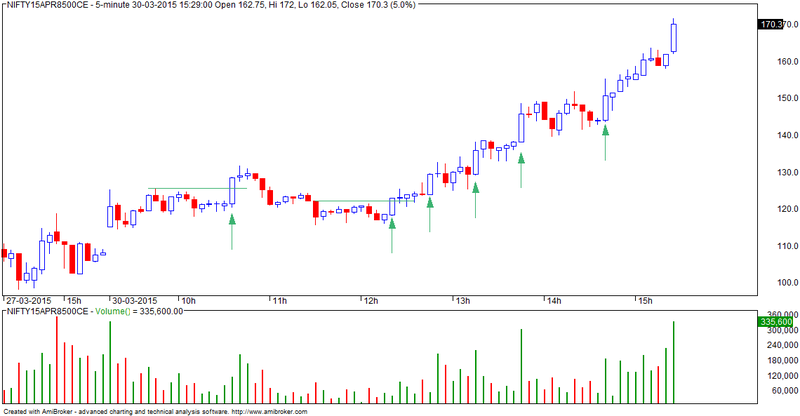 - confirmation will be trading above today's high i.e. 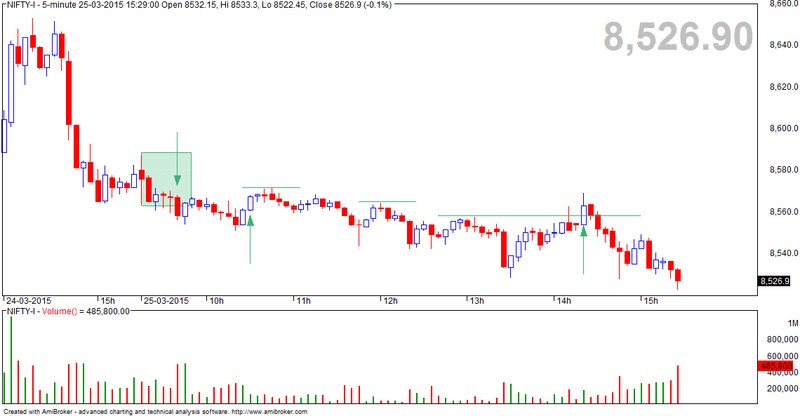 8830 spot. 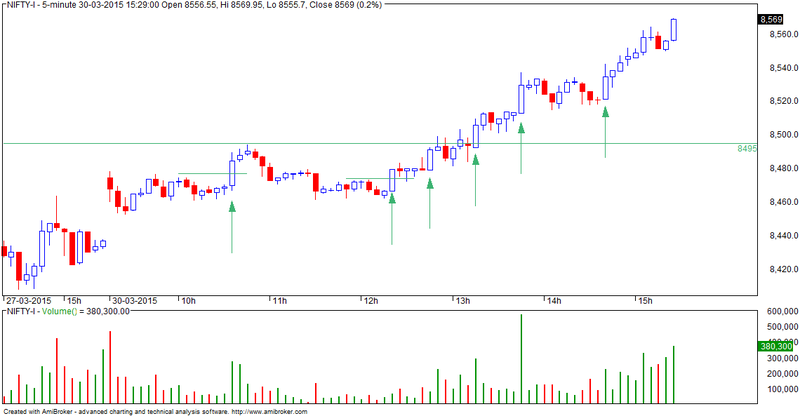 - immediate support 8500 spot. 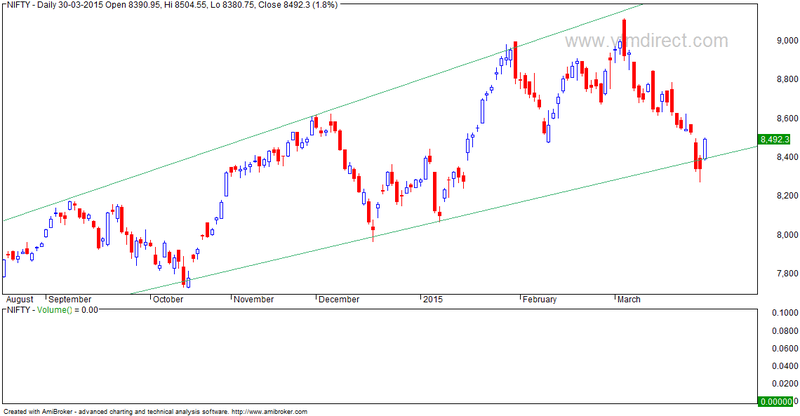 - break of 8500 can create problems for the market. 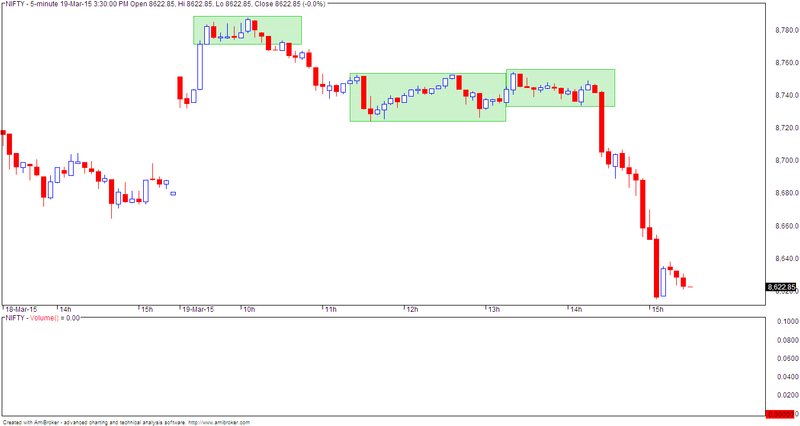 - option writing points to support at 8500 levels. - rectangles within the bigger one are for reference only... I did not trade these. 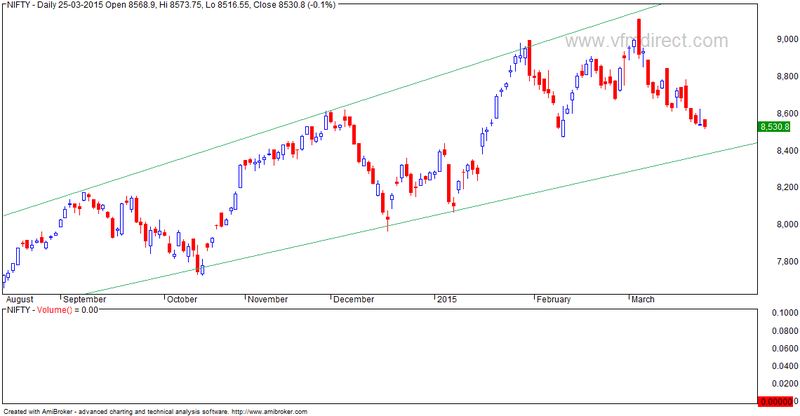 - tomorrow, expect strength if market can sustain above 8590 F.
Trend is down and will reverse on close above 3350. 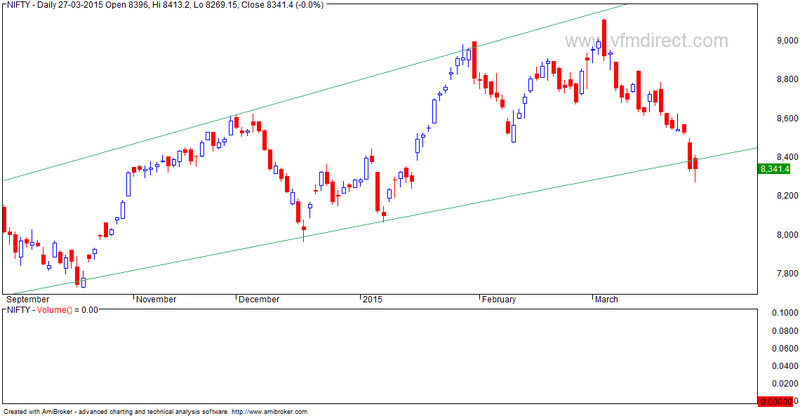 Trend is up and will on close below 25500. 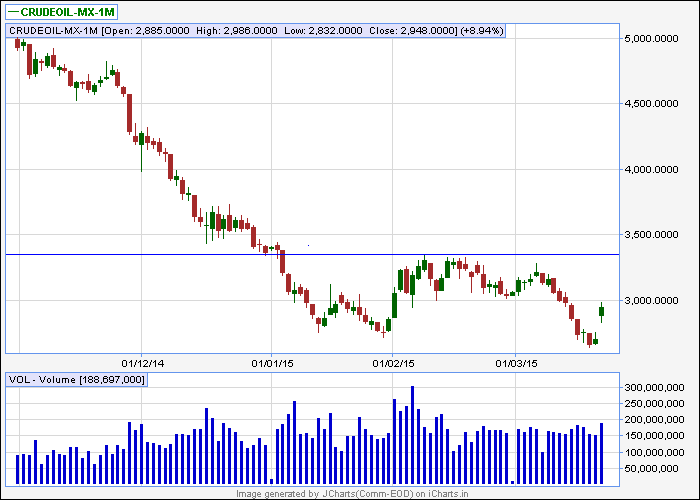 Resistance 26700-27500. 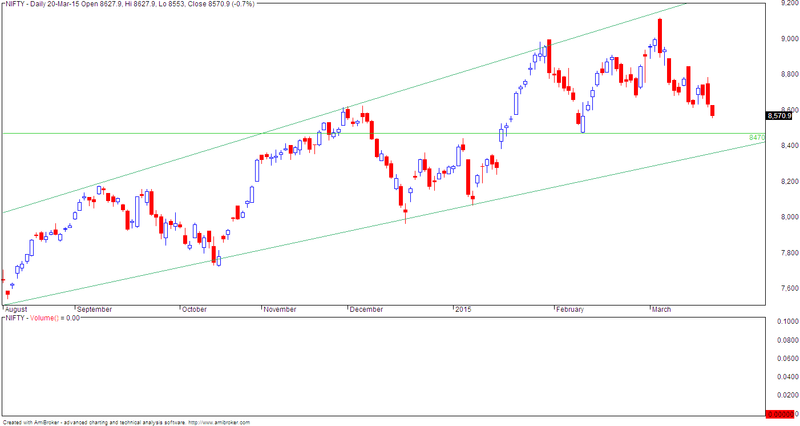 Trend is up and will reverse on close below 36000. Support 35000. 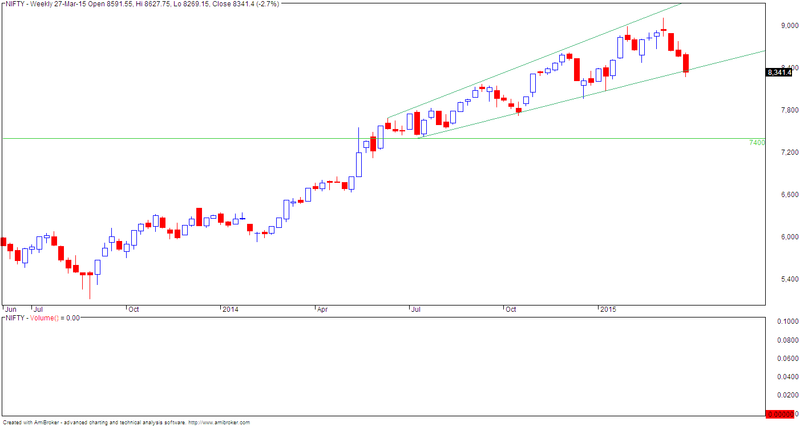 So easy to draw support lines... this is your SL for any long position you may have. 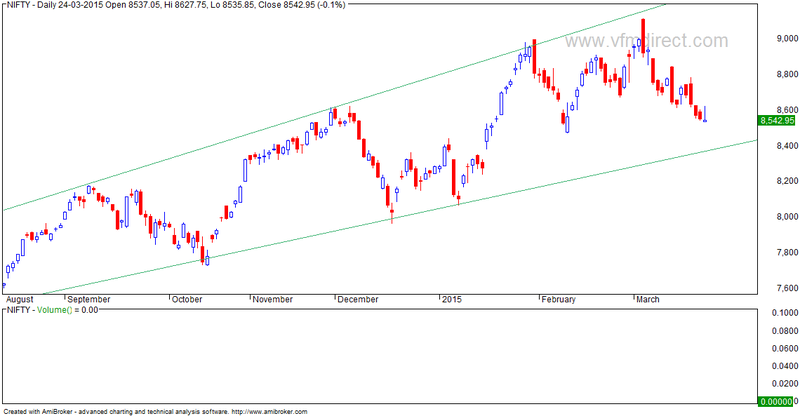 - pattern implication calls for correction to 7200 levels. 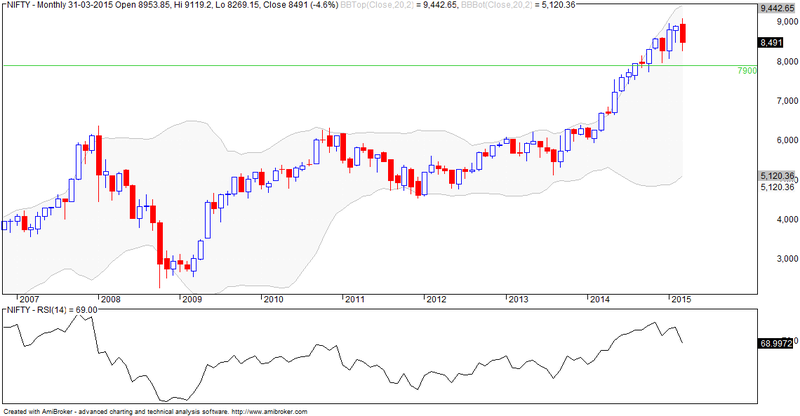 NSE Quality 30 Index aims to cover companies which have durable business model resulting in sustained growth. 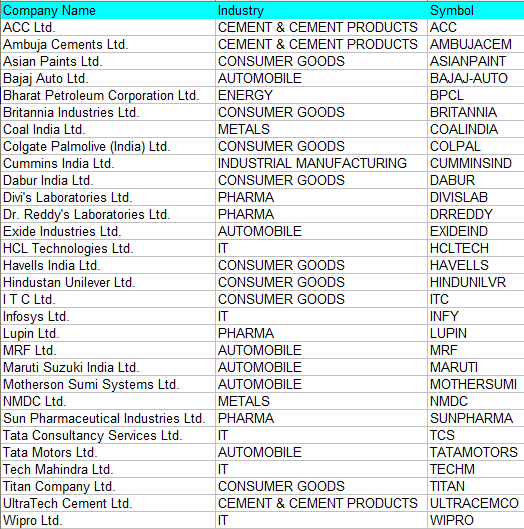 This index consists of 30 companies which are selected based on low gearing, high return on equity and profit growth. Now don't be obsessed with the exact level - this is not important. 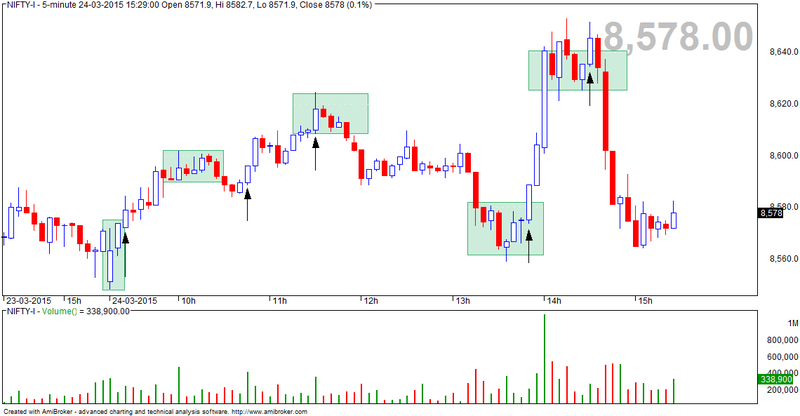 What is important is the overall structure and how the support and resistance levels develop. 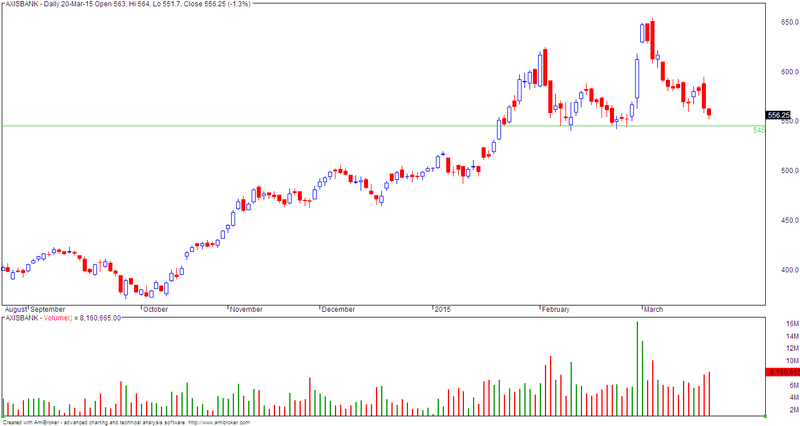 What is also important is the accompanying price behavior whenever a breakout or breakdown happens. We may be having a pin bar setup here. 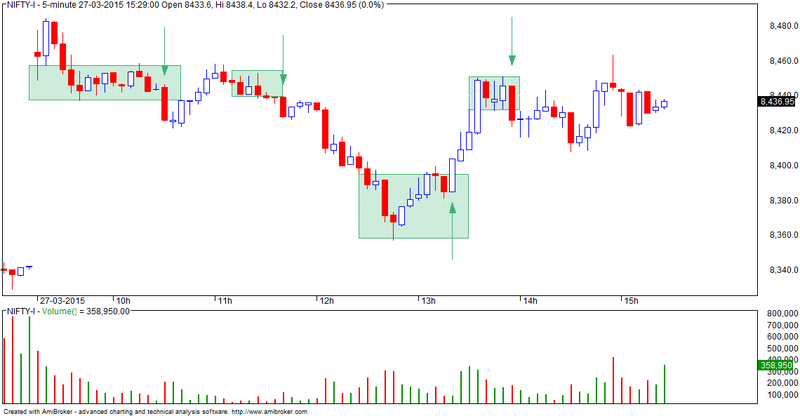 - High of second box and third box look similar in spot but there was a difference in futures chart. NOTE: in all these trades, pay attention to what happens AFTER you take a position. 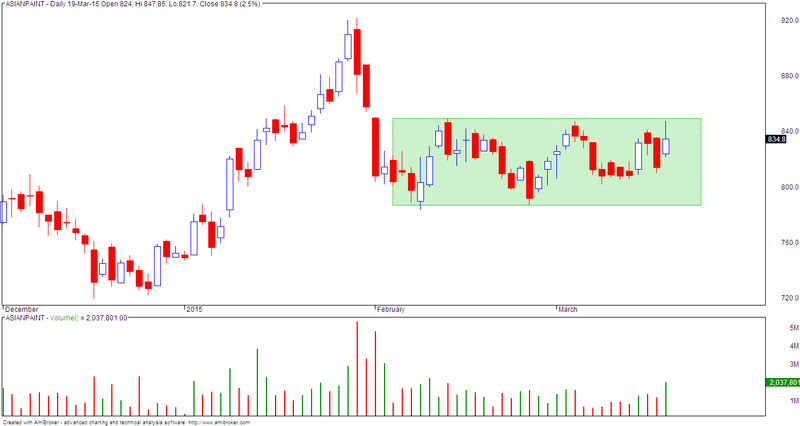 If nothing happens for 8-10 bars then something else is happening and so be prepared for a reversal. In all these trade and futures, it does not matter whether you were right or wrong. This is very important to understand if you want to be a good trader. What is very important and this will determine whether you make money or not is what did you do when you were right or wrong?